Infrared light triggers wavelike motions of atoms in a crystal of boron nitride. 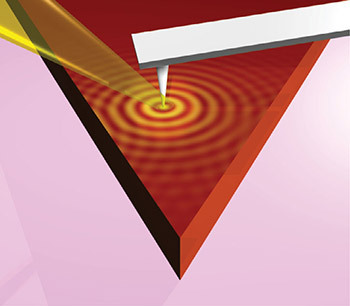 The waves, called surface phonon polaritons, can be measured with the arm of an atomic force microscope. Image by Siyuan Chen. Interference patterns develop as surface phonon polaritons propagate across atom-thin layers of crystalline boron nitride and reflect back from edges. Additional authors include Z. Fei, A.S. McLeod, M.K. Liu, M. Thiemens and M.M. Fogler of UC San Diego; Q. Ma and P. Jarillo-Herrero of MIT; A.S. Rodin of Boston University; W. Gannet, W. Regan and A. Zettl of UC Berkeley and Lawrence Berkeley National Laboratory; K. Watanabe and T. Taniguchi of the National Institute for Materials Science in Japan; Gerardo Dominguez of California State University, San Marcos; A.H. Castro Neto of Boston University and the National University of Singapore; and F. Keilmann of the Ludwig Maximilian University of Munich. The U.S. Department of Energy, Office of Naval Research, Air Force Office of Scientific Research funded this work. Additional support for participating researchers came from NASA, NSF, and the National Research Programme. Keilmann is a co-founder of Neaspec, producer of the scanning nearfield optical microscope used in this study.